This Custom Large A.D.O. 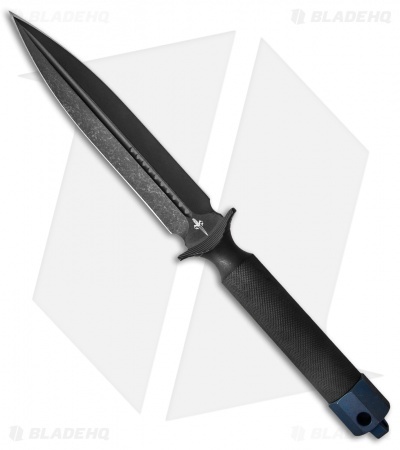 (Alpha Detachment Operative) from Microtech is hand-crafted from a solid billet of CPM-3V steel. The larger knife gives this beautiful design a more substantial platform and awe-inspiring presence. This model has a hand ground dagger blade made by Anthony Marfione. The knife has a black DLC coating with an Apocalyptic finish, and a Dagger logo on front with the model, maker initials, blade steel, and date on back. This fixed blade follows the design of Chris Reeve fixed blades with a hollow handle, accessed by unscrewing the blued titanium end cap. This A.D.O. 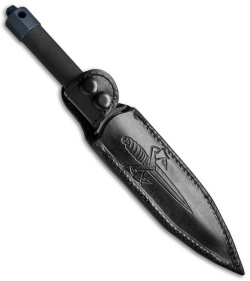 has a knurled grip and comes with a custom leather sheath with embossed Marfione Dagger Logo.